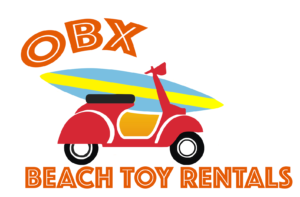 OBX Beach Toy Rentals has two store locations throughout the Outer Banks. Our Nags Head store primarily serves vacation rentals in all of Nags Head, Kill Devil Hills, Kitty Hawk, and Pirate’s Cove. Our Corolla store serves vacation rentals in Corolla, Duck, and the Northern Beaches. Our stores are currently closed for the season. We will be opening early 2019 for your spring and summer Outer Banks vacation rental needs! We can be reached via phone, so feel free to give us a call if you have any questions. Reserve your bicycle or golf cart today to ensure they are available for your 2019 vacation. Product availability is not guaranteed, and can sell out during busy weeks of the summer. Serving Nags Head, South Nags Head, Kill Devil Hills, Kitty Hawk and Pirates Cove. We are on the beach road. Just north of Jennette’s Pier in the Dare Building. Serving Corolla and the Northern Beaches. Our stores are currently closed for the winter. We will be re-opening for the 2019 season in the spring. Provide your email below, and we’ll send you an email when we have the exact opening day determined. Or, just keep checking back as spring approaches. We are looking forward to providing you with the great service you have come to expect from OBX Beach Toy Rentals! We are taking reservations for all products now. Reserve online or call us today. We encourage you to reserve early as many products will sell-out during busy weeks in the summer! Days Left Until Memorial Day! Want to be in the know as to when 2019 Opening Day is? Just provide your email address below, and we’ll notify you as soon as we know! Phones are open. Call us with any questions today! We are looking forward to a fun 2019 season in the Outer Banks… See You Soon!